Our lawyers are investigating potential cases involving infections that might have stemmed from Bair Hugger surgical warming blankets. The blankets are designed to maintain a surgical patient’s body temperatures. However, the blankets now are allegedly causing bacterial infections in cases involving joint replacement. What Does A Bair Hugger Do? The Bair Hugger warming blanket is a very interesting and well-intended invention. During surgery, the body temperature drops, as a result of anesthesia. When the body temperature drops, both bleeding and recovery time are increased. Knowing this reality of surgery, an anesthesiologist came up with the idea of the Bair Hugger warming blanket back in the 80s. The Bair Hugger is a heater and blower connected by a flexible hose to a disposable blanket. The Bair Hugger keeps the patient warm by blowing hot air on the patient, allowing their body temperature to remain at a constant 98.6 degrees Fahrenheit. The device has become extremely popular across the USA, considering that it is used in nearly 90% of all major surgeries. It has also been effective in treating hypothermia and exposure. More than 50,000 Bair Hugger units are currently in use across the country. So Why Is This Device Potentially Dangerous? 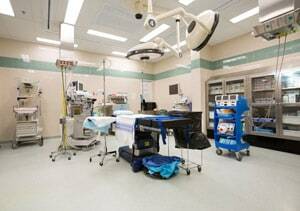 Operating rooms use Laminar Air Flow Systems, which constantly circulate filtered air throughout the operating facility. These systems prevent airborne contaminants from finding their way into an open incision and causing an infection. Because the air exhausting from the Bair Hugger blanket is warmer than the operating room temperature, a strong natural convection fluid flow current will be established. This causes the warmer air to move upwards past and perhaps through the operating field. This disrupts the flow protection against entrainment of contaminating bacteria from the surrounding uncontrolled air volume. So the Bair Hugger system has the potential to disrupt air systems by allowing some of the warm air emitted from the machine to cycle below the operating table. Once there, it can collect bacteria and carry it to the operating table. Bacteria then has the potential to enter incisions, which could obviously lead to infection. Joint replacement surgeries involving the Bair Hugger seem to produce the biggest risk of infection given how difficult deep joint infections are to treat. Did The Manufacturer Know About This Problem? There is a pretty interesting story behind this device. Its inventor sold his stake in the company and the invention back in 2002, after a dispute with his board of directors. They soon changed their name and became a subsidiary of 3M. In 2010, the inventor wrote to the company warning them about the dangers of the Bair Hugger. He insisted that a mandatory recall was imminent and that the company would not survive. His old company was hardly pleased and actually sued him for slandering the product. They insisted that he was merely trying to disparage his old company in the name of promoting his new surgical warming product, the Hot Dog. Despite the inventor’s warnings, medical journals dispelled them as myths. However, more and more complications are being reported from patients who received infections after undergoing surgery, involving the Bair Hugger. Really, the defects in the Bair Hugger forced-air warming system relating to bacterial contamination during surgery have long been acknowledged. 3M in their own literature addresses the issue. But 3M has failed to modify the design of Bair Hugger to fix the air flow pattern in the surgical field that can cause bacterial contamination. As of 2019, 4000 federal lawsuits have been filed alleging that 3M knew that the design increased the risk of joint infections, yet neglected to redesign the product. But the biggest issue is going to be the failure to warn. Did 3M step up when they knew there was a problem; so doctors and patients had the opportunity to make an informed call on whether to use a Bair Hugger? That is the key issue in these lawsuits. Plaintiffs' lawyers contend that 3M knew about the risks the Bair Hugger, at least since 2011. Despite this knowledge, there was never an attempt to redesign their product or simply warn surgeons of the risks. That is what these cases will ultimately be about. Maybe they should have fixed the Bair Hugger. Maybe it was not possible. But the key claim is that health care providers should have been warned about the true risks of the Bair Hugger, including that the Bair Hugger might be circulating contaminated air that could cause infections. Before we leave this topic, let's dig a little deeper on exactly what the problem is with the Bair Hugger. The most likely theory that will work for plaintiffs is the "Reservoir of Infection" theory. This theory, postulated by plaintiffs' experts, contends that Bair Hugger pulls the bacteria from the operating room floor and puts it back into the air without an adequate filter. This escaped air creates air flow currents that flow against the downward air flow of the operating room. So as warm air rises, bacteria is transported from the floor of the surgical room into the patient's surgical wound. This theory has been around long before the lawsuits began to fly in this litigation. Specifically, one expert contends that the "air velocity at the floor under the Bair Hugger is sufficient to entrain particles from the floor." Chances are if you received a knee or hip implant, a Bair Hugger was used during your surgery. The device is used in approximately 80% of all implant procedures. Why are we focused on hip and knee? Patients undergoing hip and knee joint replacement procedures are especially at risk for infection because the procedure is long and invasive. If you received an infection and had to undergo a subsequent surgery, you should discuss your options with an attorney. Some of the key signs of infection in these cases would include: fatigue, fever, pain, stiffness, swelling, redness around the incision, and wound drainage. If you have experienced these side-effects and required revision surgery, discussing your case with an attorney is necessary. There are now over 5000 surgical infection victims with cases pending. There has been one bellwether trial that resulted in a verdict for the defendant. The lawsuits in state court in Minnesota -- only about 60 or so -- have been dismissed. The result? Many Bair Hugger victims' lawyers have run for the hills. Google "Bair Hugger Lawsuit" and you no longer see a long stream of paid ads (bizarrely, you see ads for another 3M product, Combat Arms earplugs). But there is a reason to still be encouraged. Mass tort cases usually begin with defense verdicts. The bar to bring a medical/scientific case is must stricter in Minnesota state court (Fyre-Mack test) than it is in federal court. Just one victory in court -- just one -- would totally change the landscape of this litigation. We hope to update this page soon with news of a plaintiffs' victory. How Much Will Bear Hugger Infection Settlements Be Worth? Assuming that it can be proven that the Bair Hugger was negligently made or 3M neglected its duty by failing to warn, what is the settlement value of these claims? This is the type of litigation where the settlement values will vary wildly depending on the injury. Generally, what happens it that the settlement puts the victims in tiers or brackets based on the severity of the injury. What those amounts might look like is very hard to predict at this point. Certainly, the trial value of many of these infection cases is in the millions. The attorneys at Miller & Zois are currently looking at Bair Hugger Infection cases. If you or a loved one contracted an infection after a knee or hip implant surgery, give us a call at 800-553-8082 for a free consultation.